You see blackjack games as parts of many movies whether they are from Hollywood or not. Generally, blackjack is just a part of the scene that is in the background if the movie is based in a casino. However, there are movies where the game of blackjack is very important to the theme or plot. Some movies that contain blackjack are listed below. This movie makes card counting look "cool" It is based around the famous blackjack team, MIT. Ben Campbell is a MIT student that struggles to find the way to get through Harvard and pay for the tuition and fees. He finds out that he can make the needed money by playing blackjack and using card counting. This is actually an instructional DVD that was made by the Blackjack Institution. 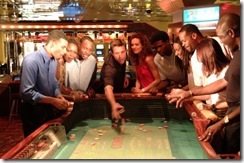 It teaches the player the basic strategy of blackjack and how to card count. Mike Aponte, a member of the MIT team as well as some other members will show you how to card count by using simple and clear explanations and then show you through an interactive section. If you are tired of reading blackjack books, watch this movie. This movie is a quiet movie about crime and the London casinos as seen through the eyes of Jack Manfred. Jack is a novelist who is trying to get past his writer's block by getting a job as a croupier in order o pay his bills and find some much needed inspiration. It doesn't take him long to find a fascination in those who lose. Jack then find a drive to create a narrative that is captivating and comes to find his actions easier. This is a documentary about card counting. It is easily accessible for those who do not know about advantage play. Professional card counters, a specialized attorney, a Griffin Investigations detective, blackjack authors and casino executives are all interviewed by David Layton.